Vicki Stamps, OCC volunteers visit Rwanda, distribute to excited children shoeboxes of gifts, love. 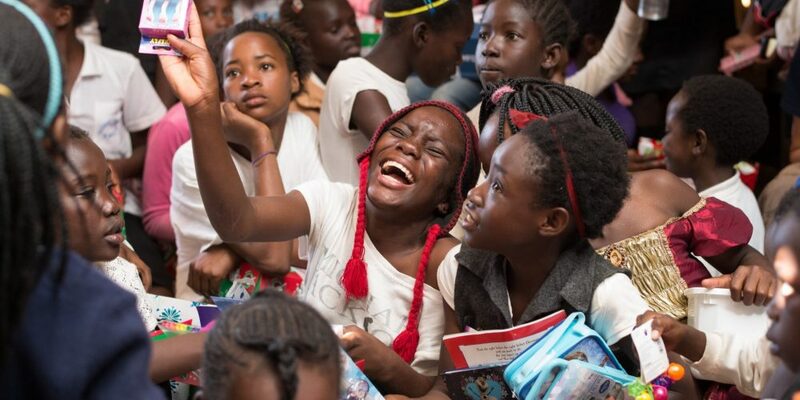 Vicki Stamps is coordinator of Operation Christmas Child (https://www.samaritanspurse.org/what-we-do/operation-christmas-child/) for St. Louis City and County, perhaps resulting in as much joy among the OCC volunteers as the precious children receiving these shoeboxes gifts of love! She has been committed to this wonderful work since her daughter — now a young adult – was a little girl. Recently Vicki was among a group of volunteers who visited the civil “war torn” country (in the 1990’s) to see the wonderful results of their OCC work, even distributing one by one the shoebox of gifts to the needy children while there. Hear Vicki speak about Samaritans Purse, Operation Christmas Child, and her 2017 Rwandan visit … in her on words. To learn more About Samaritans Purse, sponsoring ministry of Operation Christmas Child, click here.